The hard work by CUPE Saskatchewan and our allies to protect public health care from two-tier privatization has resulted in a win with the federal Minister of Health advising the provincial government its user-pay MRI scan legislation undermines public health care and should come to an end. In 2014, the Saskatchewan government first announced it would be tabling legislation allowing for profit corporations to charge individuals for medically necessary MRI testing. They have since tabled legislation expanding privatization to allow for user-pay CT scans as well. The Saskatchewan Party government claims that privatization is the answer for reducing wait times, but this contradicts evidence and expert opinion while striking at the foundational principle of Medicare: equal access to health care based on need rather than private wealth. Private clinics also hurt the public system by taking professionals and resources from the public system. 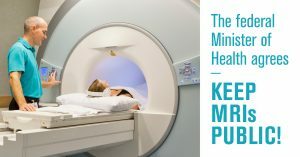 Last year, a legal opinion commissioned by CUPE found that the Saskatchewan government’s legislation ushering in private, for-profit MRI clinics violates the Canada Health Act. 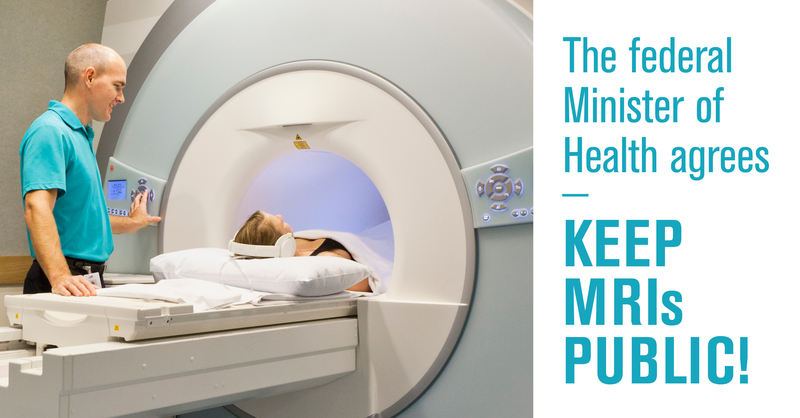 In December 2015, CUPE sent a letter to the federal Minister of Health, the Honourable Jane Philpott, requesting a review of the Wall government’s Bill 179, permitting private user-pay MRI facilities. This move is a positive step forward, but more work needs to be done to ensure that the Sask Party abandons its flawed approach which passes more costs onto patients and takes away investments in the public system. CUPE will continue to fight to protect public health care from privatization, including user-pay MRI and CT scan legislation.